In Part 39, we have discussed the basics of views. In this session we will learn about Updateable Views. Let's create tblEmployees table and populate it with some sample data. 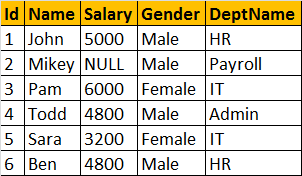 Let's create a view, which returns all the columns from the tblEmployees table, except Salary column. Select data from the view: A view does not store any data. So, when this query is executed, the database engine actually retrieves data, from the underlying tblEmployee base table. 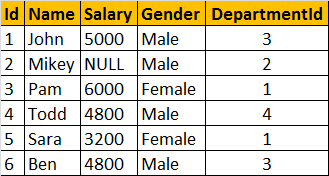 Is it possible to Insert, Update and delete rows, from the underlying tblEmployees table, using view vWEmployeesDataExceptSalary? Yes, SQL server views are updateable. The following query updates, Name column from Mike to Mikey. Though, we are updating the view, SQL server, correctly updates the base table tblEmployee. To verify, execute, SELECT statement, on tblEmployee table. Along the same lines, it is also possible to insert and delete rows from the base table using views. Now, let us see, what happens if our view is based on multiple base tables. For this purpose, let's create tblDepartment table and populate with some sample data. Create a view which joins tblEmployee and tblDepartment tables, and return the result as shown below. Now, let's update, John's department, from HR to IT. At the moment, there are 2 employees (Ben, and John) in the HR department. Notice, that Ben's department is also changed to IT. To understand the reasons for incorrect UPDATE, select Data from tblDepartment and tblEmployee base tables. The UPDATE statement, updated DeptName from HR to IT in tblDepartment table, instead of upadting DepartmentId column in tblEmployee table. So, the conclusion - If a view is based on multiple tables, and if you update the view, it may not update the underlying base tables correctly. To correctly update a view, that is based on multiple table, INSTEAD OF triggers are used. We will discuss about triggers and correctly updating a view that is based on multiple tables, in a later video session. Sir, I an great fan of your videos. I have learnt so many things from it. An Update statement with View can effect on table data?? You will have to give the permissions to the tables to not update by the others. Venkat already explained this for functions. same can be applied here for view as well. I mean schema binding. Today i attended an interview and i was asked if we have index on views and we need to update that view, then should we update the view after dropping index or not? 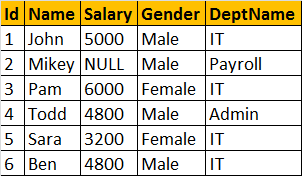 Insert into vWEmploteeesDataExceptSalary values (2, 'Mikey', 'Male',2) the values has inserted but what about the Salary field of Mikey, we have not supplied any value to that field, So it may get NULL or any other value?